I hardly know where to begin this month. Things are looking so good right now that I’m practically giddy with it all every time I step outside. The responsible part of me says that I should be weeding or harvesting veggies or taking the boys for a walk (or doing actual work), while the rest of me wants to just grab my camera and wander around to capture every part of the late-summer spectacle. From some angles, the courtyard looks pretty much the same as it always has at this time of year: mostly pink and white, with lots of perennials and grasses. 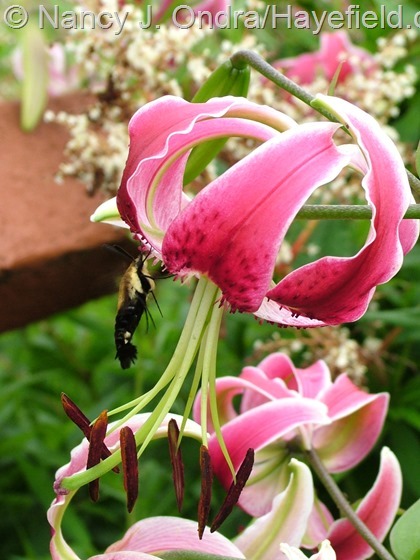 The ‘Black Beauty’ Orienpet lilies have been flowering for over 3 weeks now. Having them right next to the path from the house to the barn means that I get to enjoy their beauty and fragrance many times each day. Lots of butterflies and other interesting insects (like the hummingbird moths) enjoy them too. The purple coneflowers (Echinacea purpurea) are also emphatically pink. Above they’re with little bluestem (Schizachyrium scoparium); below, from the other direction, they’re between ‘The Blues’ little bluestem and taller ‘Dewey Blue’ bitter panicgrass (Panicum amarum). This area is even prettier in early evening, when backlit by the setting sun. From this angle, you can also see the fluffy spikes of ‘Cassian’ fountain grass (Pennisetum alopecuroides) and, in the background, the nodding tails of white Japanese burnet (Sanguisorba tenuifolia ‘Alba’). There’s more pink from the Joe-Pye weeds: in the front, Eutrochium dubium ‘Little Joe’ and in back, E. purpureum. Along the cross paths through this area, though, I’ve been tucking in some brighter colors. 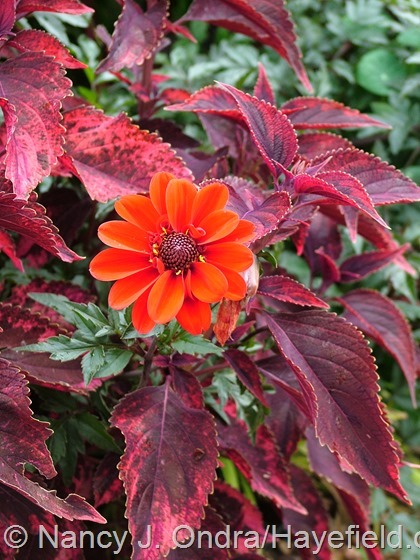 When it comes to “bright,” it’s hard to beat ‘Zahara Scarlet’ zinnia! 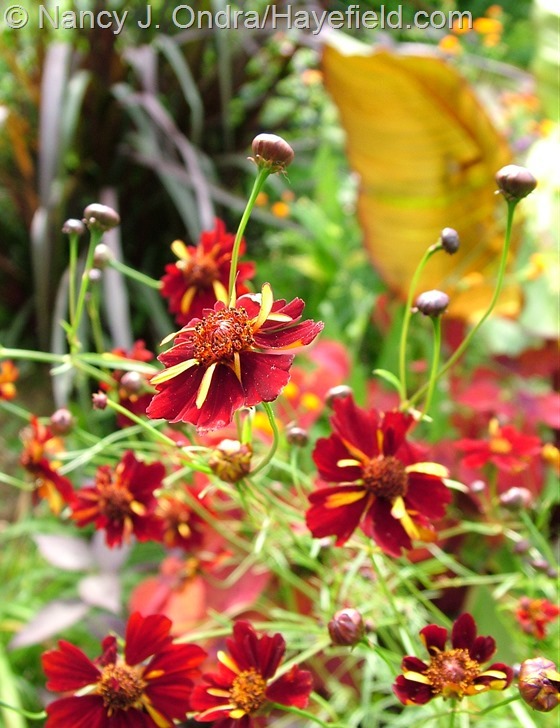 Annual ‘Roulette’ coreopsis (Coreopsis tinctoria) is more subtle, with rich red and gold flowers on wispier plants. 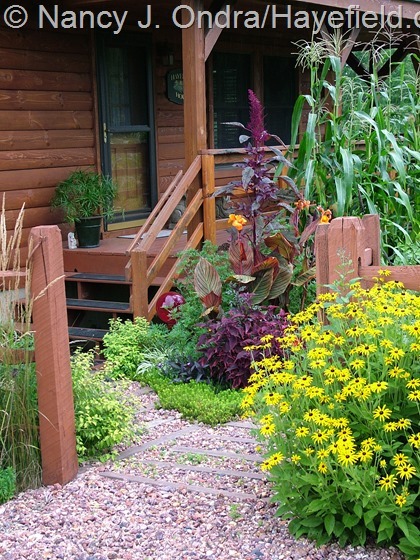 The bright colors continue into the front garden, with lots of cannas and coleus. The ‘Glass Gem’ corn has gotten huge and looks like it has many ears, but as far as I can tell, there are few kernels forming. If I try it again, I will plant it in a block for better pollination, as you’re supposed to. I guess I’ve gotten spoiled by the other corns I’ve been growing, because they seem to be able to produce good ears with just a few plants. The other side of the front path is looking very good this year. 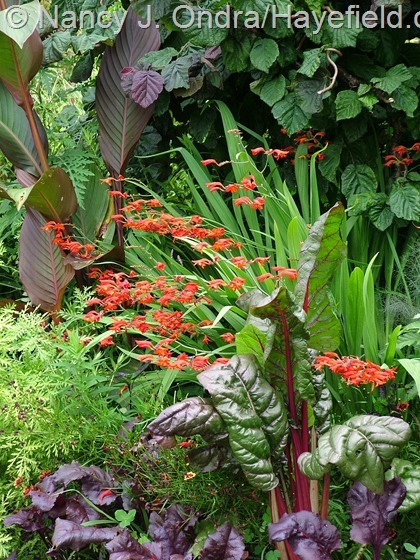 A few of the most noticeable plants include ‘Australia’ and Tropicanna (‘Phaison’) cannas, Japanese blood grass (Imperata cylindrica ‘Rubra’), ‘Golden Delicious’ pineapple sage (Salvia elegans), ‘Isla Gold’ tansy (Tanacetum vulgare), ‘Gerald Darby’ iris, and ‘Red Majestic’ contorted hazel (Corylus avellana). 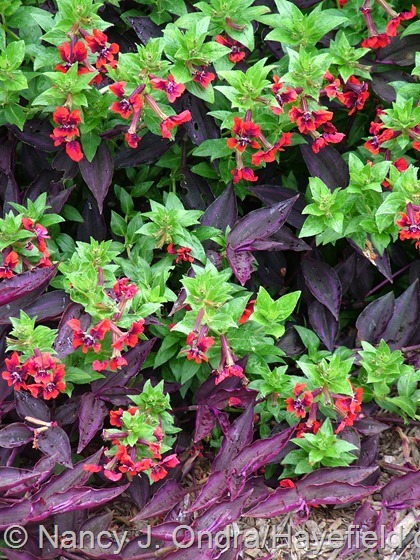 Below is a bit of detail from that area: ‘Flamenco Samba’ cuphea with an all-purple form of wandering Jew (Tradescantia zebrina). Walking a little farther down the path and turning right produces these two views. 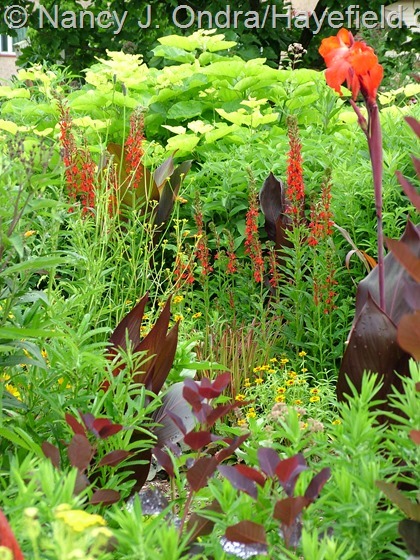 To the right (above) is a vignette of ‘Emberglow’ crocosmia with ‘Prima Rosa’ chard, ‘Bull’s Blood’ beets, Canna indica var. purpurea, and the ‘Red Majestic’ contorted hazel. 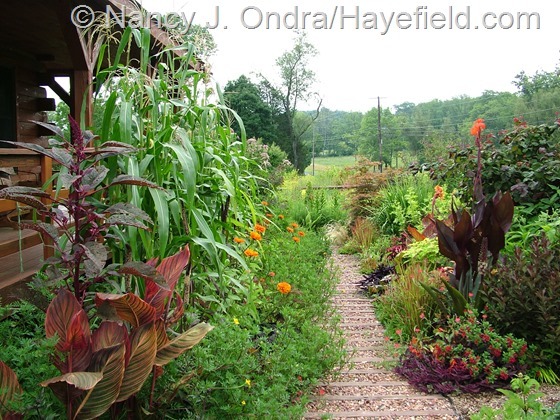 To the left (below) is a glimpse further into the garden, with cardinal flower (Lobelia cardinalis) and ‘Australia’ cannas against golden catalpa (Catalpa bignonioides ‘Aurea’). 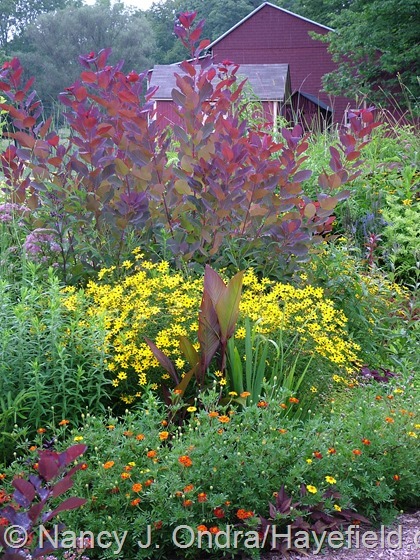 Purple smokebushes (Cotinus) are stars in the middle of the front garden. Above is a view from the porch, with ‘Velvet Cloak’ in the foreground and hybrid ‘Grace’ behind. I cut both of these down to 12 to 18 inches before new growth started in spring, then nipped them back again, by about half, in June. Below is a closer view of ‘Grace’. By this point, you can tell that there’s a lot of purple, yellow, orange, and red in this area. Below is one of my favorite combinations this year: golden lace (Patrinia scabiosa) with ‘Orange King’ zinnia. Above and below are shots of the middle path, one from each end. And below, looking back along the main front path. 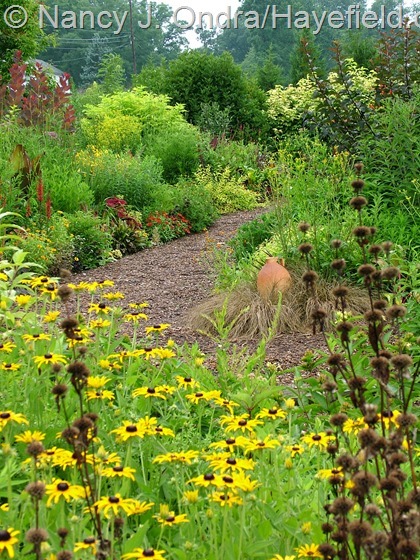 In this part of the side garden, there’s lots of yellow now from the golden lace and the black-eyed Susans (Rudbeckia fulgida var. fulgida). 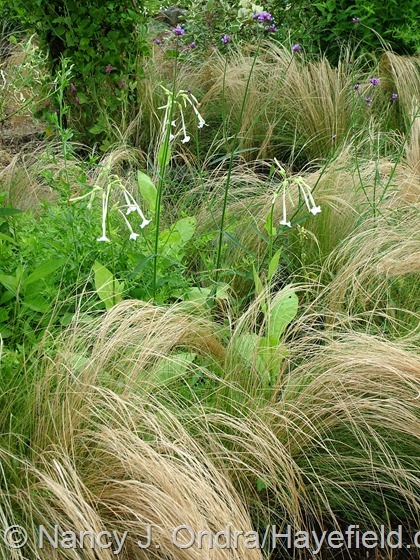 Mexican feather grass (Stipa tenuissima) is a recurring theme in the quieter parts of the side garden. Above it’s with ‘Big Ears’ lamb’s ears (Stachys byzantina), dwarf fleeceflower (Persicaria affine), and a NOID Japanese maple (Acer palmatum). Below it’s with Nicotiana sylvestris and Verbena bonariensis. Below are several more shots of this area. 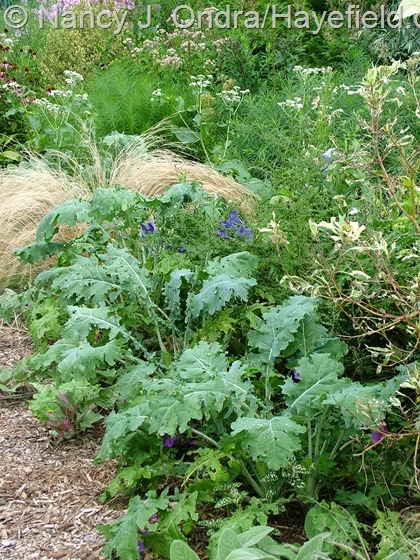 And below, a close-up from the area shown above, with ‘White Russian’ kale and wild quinine (Parthenium integrifolium). Above is a view of the area out back, taken from the back porch. 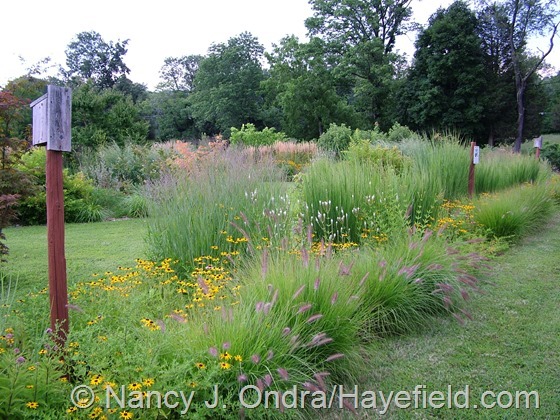 Below is closer view of the perennial meadow area. 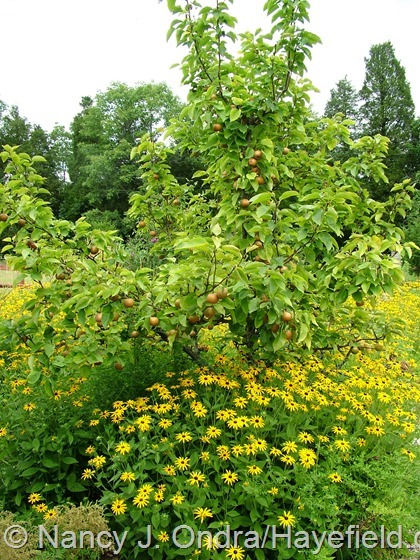 The black-eyed Susans are most noticeable, but there are lots of other things in there too, such as a 4-in-1 Asian pear (above) and one of my pawpaws (Asimina triloba), as well as a variety of later-flowering perennials. Above and below are the same area looking back toward the side garden and house. The veggies are looking great this year, thanks to all of the rain. The squash are usually dead or dying by now due to squash borers, but they survived with just a bit of wilting and have come back even stronger. 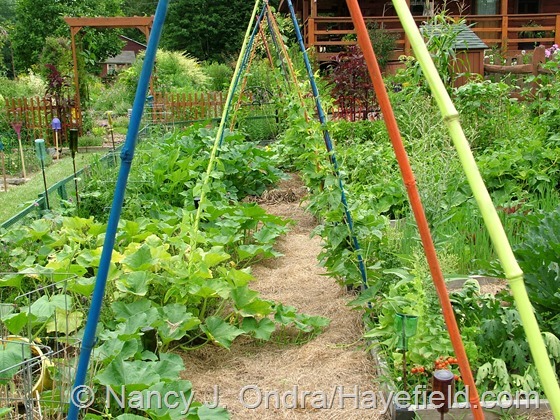 It’s going to be hard to find space for the fall crops now! 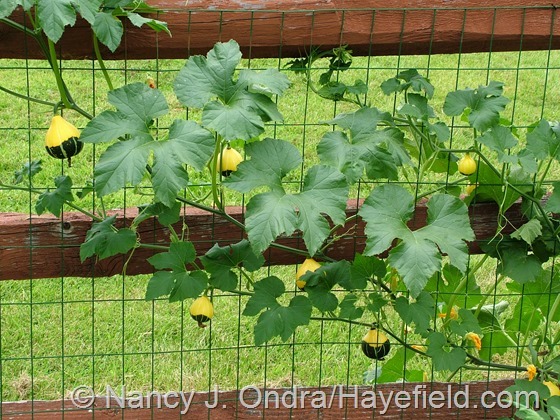 Below is a cute little gourd that seeds around each year. This one obligingly placed itself on the fence that separates the veg garden from the pasture. Apparently alpacas do not find gourds tasty. 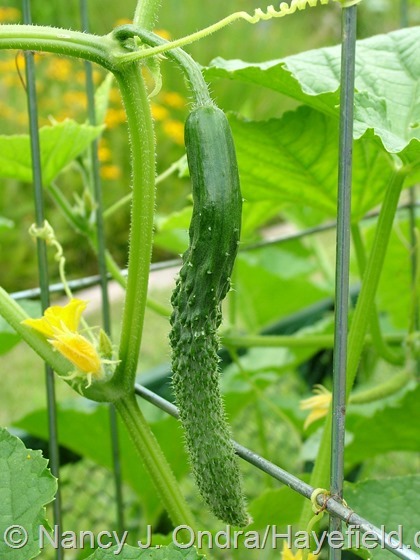 I’m enjoying some new things out there this year, including a really neat cucumber from central China. 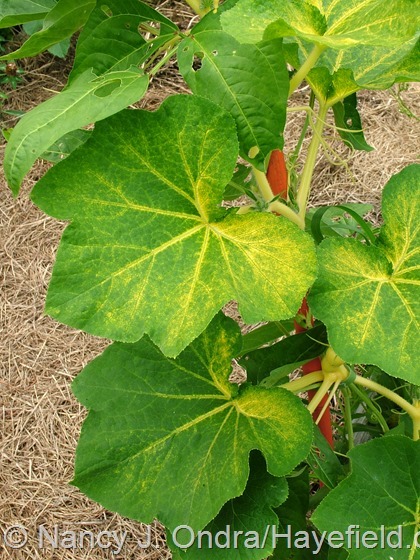 Below is a gift from Rick Rickman: ‘Autumn Glow’ winter squash, with gorgeous variegated foliage and yellow stems. Above and below is‘Old Gold’ corn. 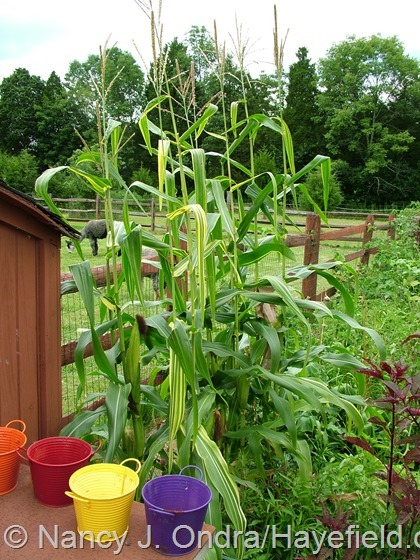 It’s a dent (field) corn, not a sweet corn, so it’s “chust for nice,” not for eating. 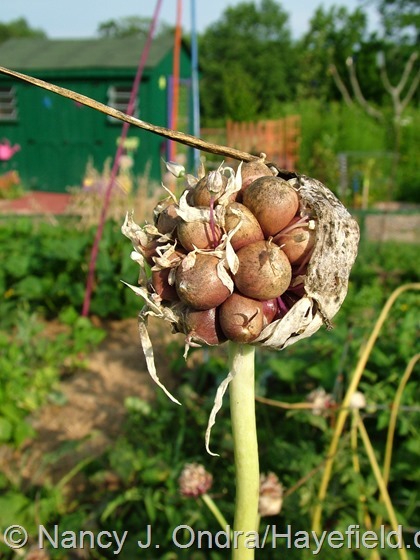 The garlics are just about finished flowering now. Some of them produced these dainty flowers, which mature into heads of tiny bulbils. Things are looking good outside of the fenced area, too. Above and below are two views of the Arc Borders. I finally had a chance to weed and edge the TDF Border out front, which imposed some much-needed tidiness on the exuberance. 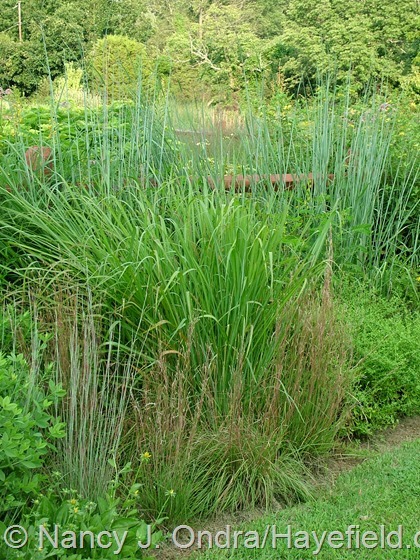 Below is a bit of grassy detail from the center of that border, with eastern gamagrass (Tripsacum dactyloides) in front of ‘Indian Steel’ Indian grass (Sorghastrum nutans) and behind little bluestem (Schizachyrium scoparium: ‘The Blues’ on the left and the straight species on the right). Walking down along the road and looking back, the end of the Long Border overlaps with the TDF Border, making the whole thing look like one huge planting. 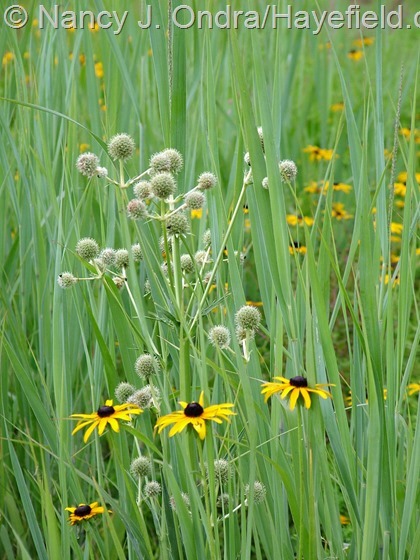 Below is a bit of detail from the foreground above, with rattlesnake master (Eryngium yuccifolium) and black-eyed Susan (Rudbeckia fulgida var. 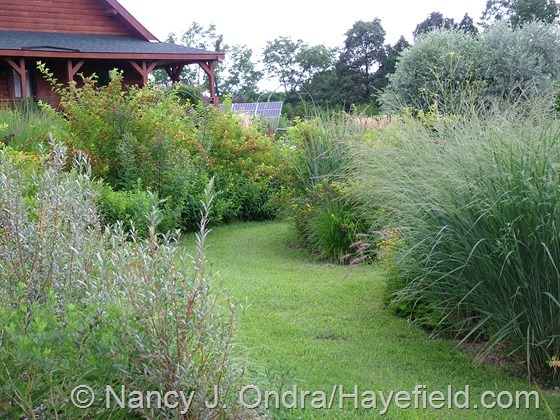 fulgida) mingled with ‘Dallas Blues’ switch grass (Panicum virgatum). 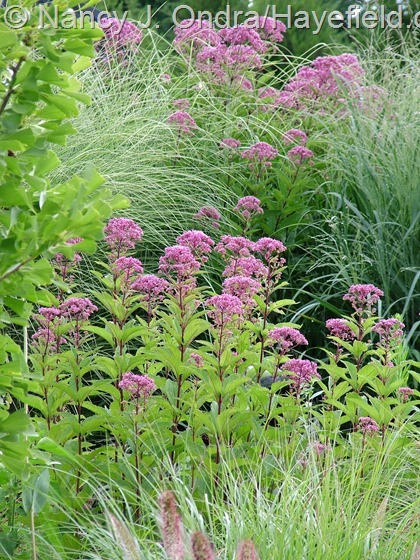 It contains duplicates of many of the perennials and grasses you’ve already seen in this post. The only different thing is the dark seedheads of Carolina lupine (Thermopsis villosa) in the center. Still, it’s neat to see how the same plants can put themselves together in different ways. 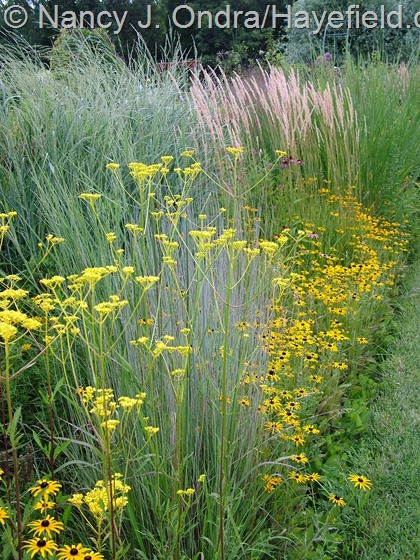 I really like the golden lace (Patrinia scabiosifolia) with bright reds and oranges, but it’s also lovely with silvery blues, such as ‘The Blues’ little bluestem (Schizachyrium scoparium) and ‘Dewey Blue’ bitter panicgrass (Panicum amarum). 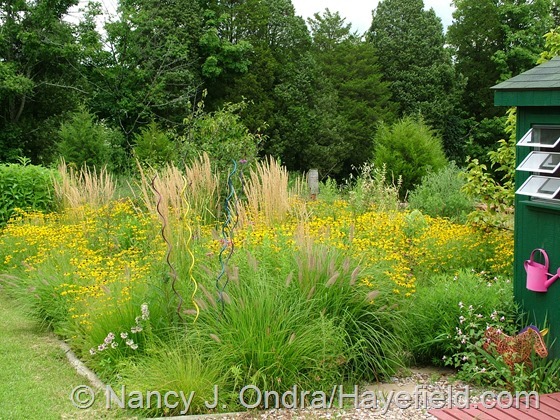 The shot below also includes more black-eyed Susans and ‘Karl Foerster’ feather reed grass (Calamagrostis x acutiflora). 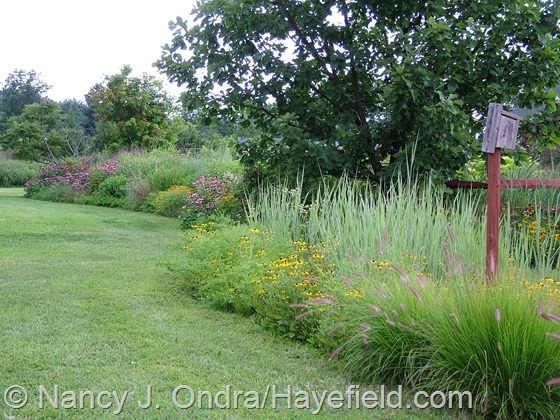 Looking down the Long Border, more of the ‘Cassian’ fountain grass and black-eyed Susans with ‘Northwind’ switch grass (Panicum virgatum) and Culver’s root (Veronicastrum virginicum). And here’s a path between some of the Shrubbery beds: ‘Chermesina’ willow (Salix alba) on the left, ‘Dewey Blue’ bitter panicgrass on the right, and silver willow (S. alba var. sericea) in the back. Above, one of my new favorite annuals, ‘Soleado’ zinnia (Zinnia haageana) with ‘Red Star’ dracaena (Cordyline australis) and Japanese blood grass (Imperata cylindrica ‘Rubra’). 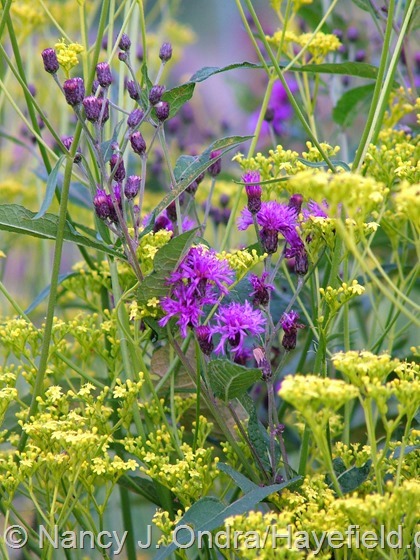 Below, New York ironweed (Vernonia noveboracensis) with golden lace (Patrinia scabiosifolia). 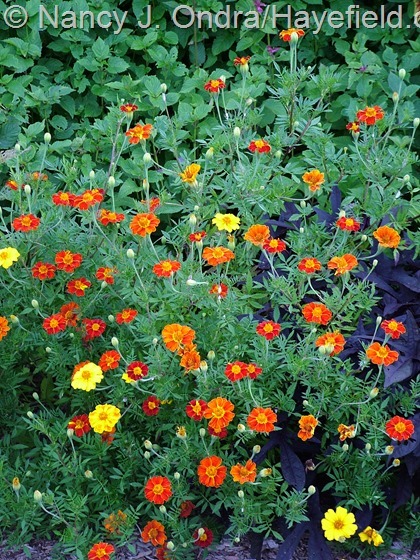 Above, a terrific little no-name marigold that I’m crazy about; more on that in an upcoming post. 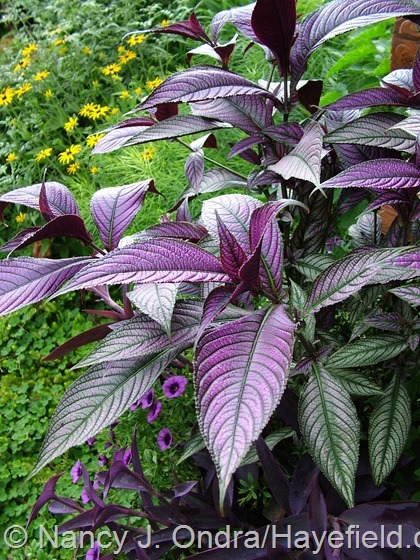 Below, Persian shield (Strobilanthes dyerianus). Above, detail from a planter out by the barn, with Alternanthera ‘Red Threads’, ‘Million Suns’ creeping zinnia (Sanvitalia), ‘Illusion Garnet Lace’ sweet potato vine (Ipomoea batatas), ‘Black Pearl’ pepper (Capsicum annuum), ‘Profusion Orange’ zinnia, and a bit of Fiona Sunrise jasmine (Jasminum officinale ‘Frojas’). Below, ‘Bishop of Llandaff’ dahlia with ‘Religious Radish’ coleus. Above, ‘Flamingo Feather’ spike celosia (Celosia spicata) with okra. 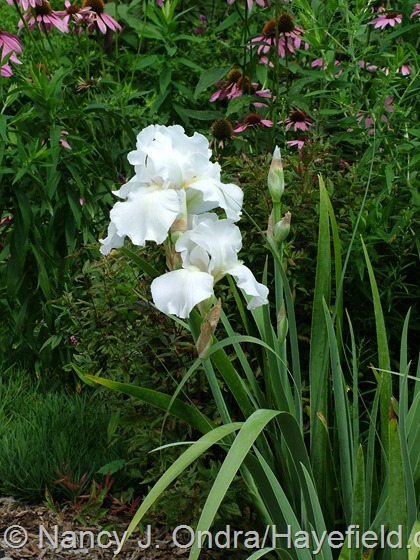 Below, ‘Immortality’ iris back for a second round of bloom for this year. Hooray for reblooming irises! Above, blue pimpernel (Anagallis monellii); below, Rumex flexuosus. 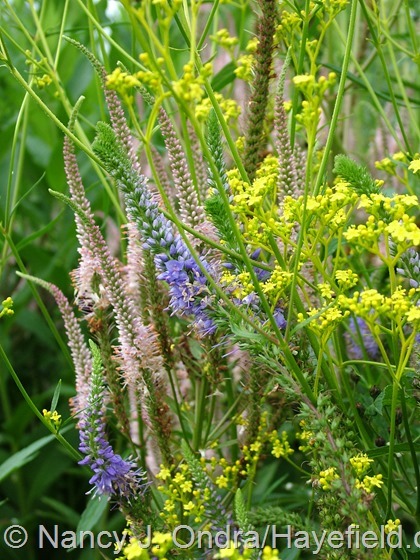 Above, ‘Oakhurst’ pineapple lily (Eucomis comosa); below, a mingling of Veronica grandis, ‘Erica’ Culver’s root (Veronicastrum virginicum), and golden lace (Patrinia scabiosifolia). 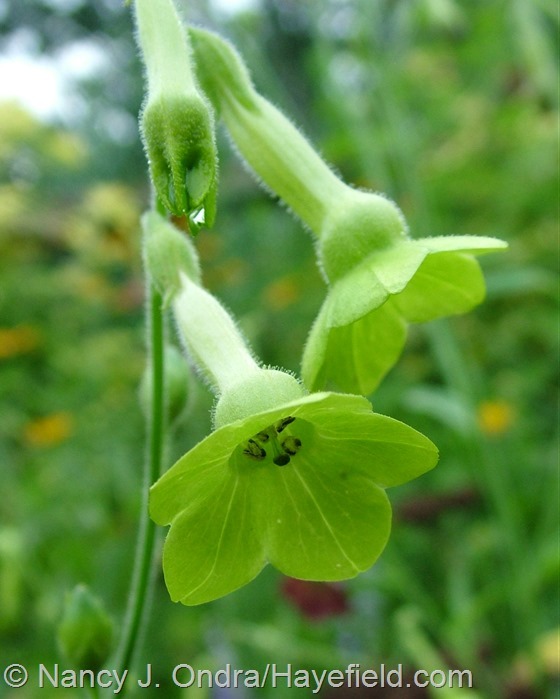 Above, a good representative of ‘Ondra’s Green Mix’ nicotiana. 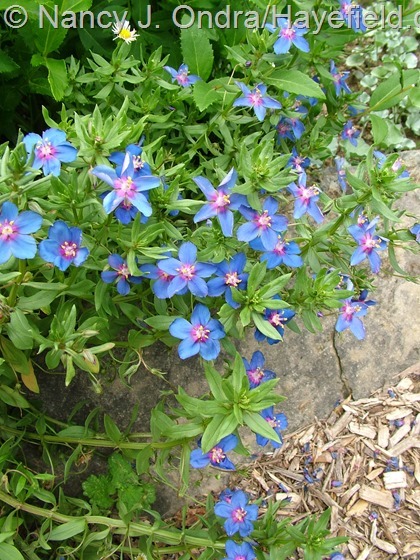 One person who received seeds of this from my giveaway last fall reported back that some of his plants produced brown flowers as well. 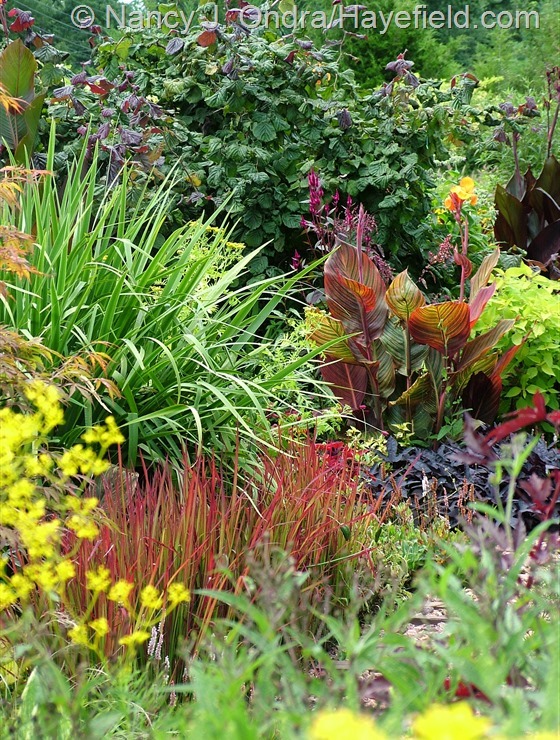 I too noticed that there’s a range of greens, pinkish browns, and intermediates in the front garden this year. I guess I’ll use ‘Ondra’s Mint Chocolate Mix’ for the seeds I collect this year, then try to get the original all-green strain back from some isolated green plants out back. 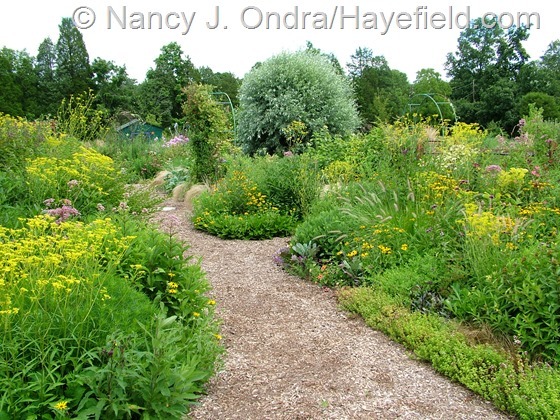 But in the meantime, I’d be interested in hearing from those of you who received seeds of ‘Ondra’s Green Mix’ last fall, to know how yours turned out. 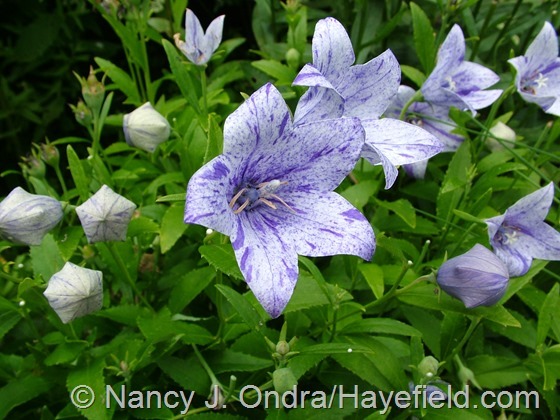 The same goes for those of you who got seed of the ‘Axminster Streaked’ balloon flower below: did yours come mostly true (with varying amounts of blue and white in each flower)? Feel free to report back on any of the other seeds as well, whether they worked out or they didn’t. It would be helpful to know if a number of people had poor luck with any of the seeds, so I don’t bother collecting and cleaning them for this year’s giveaway. 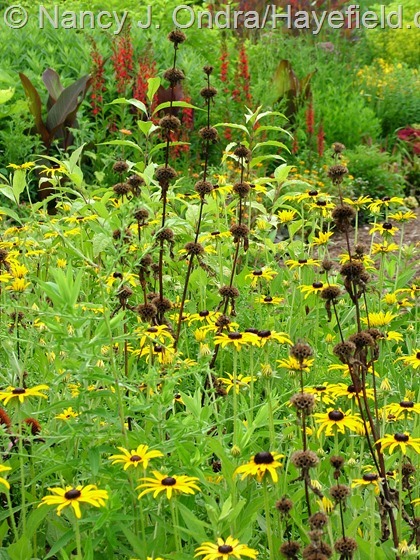 Ok, back to the plants: above, the seedheads of ‘Amazone’ tuberous Jerusalem sage (Phlomis tuberosa) with black-eyed Susans (Rudbeckia fulgida var. 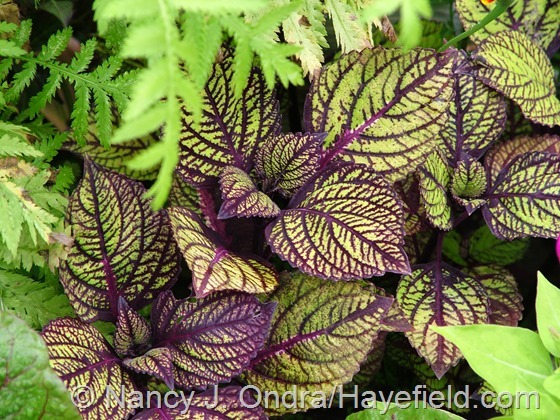 fulgida); below, ‘Fishnet Stockings’ coleus. 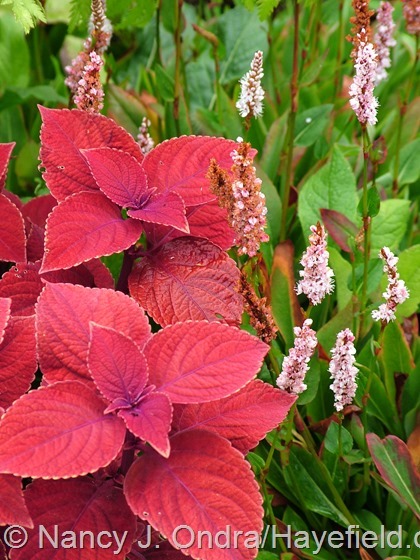 Above, ‘Keystone Kopper’ coleus with dwarf fleeceflower (Persicaria affine); below, purple-leaved plantain (Plantago major ‘Atropurpurea’). Above, Cuphea viscosissima, which is commonly known as blue waxweed—which is weird, as it is neither blue nor waxy—or clammy cuphea. The latter name makes a bit more sense, as it definitely feels sticky. You can see the short, sticky hairs that cover many parts of the plant. 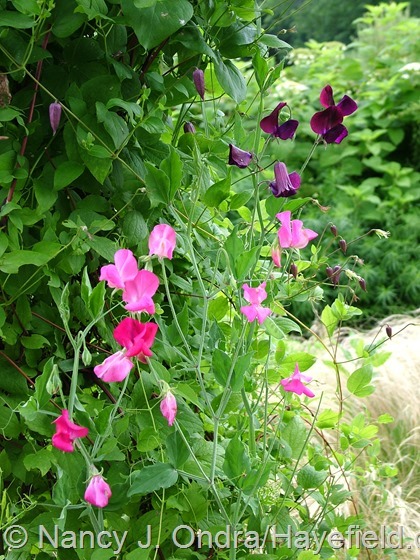 Below, just some ordinary sweet peas (Lathyrus odoratus), here to celebrate the very existence of fragrant sweet peas in the middle of a Pennsylvania August. 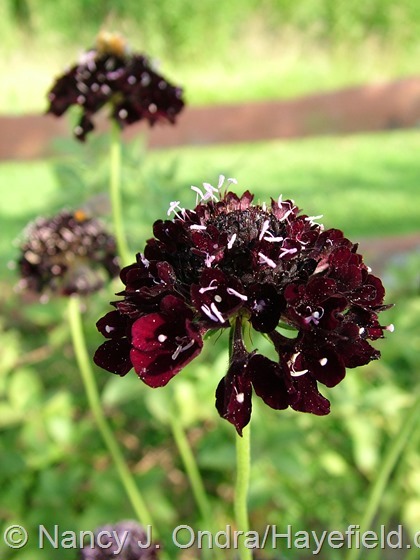 Above, sweet scabious (Scabiosa atropurpurea; thanks for the seeds, Clark! 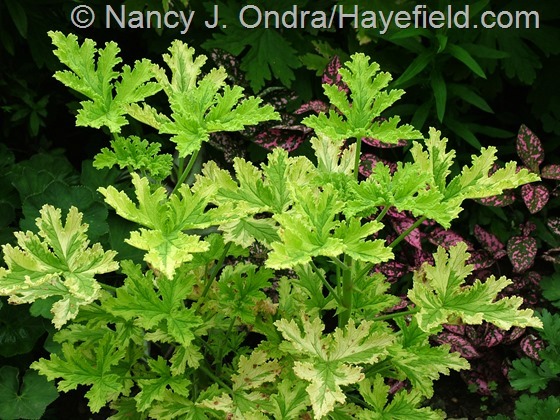 ); below, ‘Charity’ scented geranium (Pelargonium). 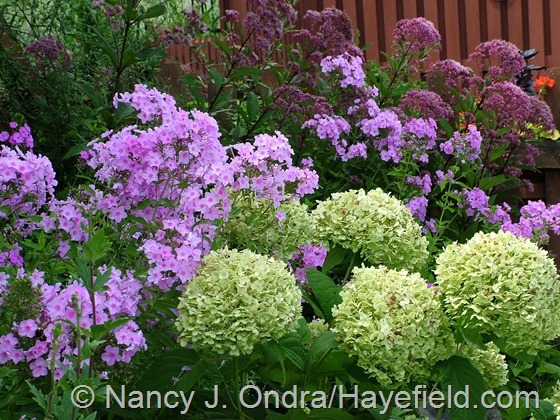 Out back, a pretty mix of smooth hydrangea (Hydrangea arborescens), summer phlox (Phlox paniculata), and Joe-Pye weed (Eutrochium purpureum). Oh, the indignity of it all. 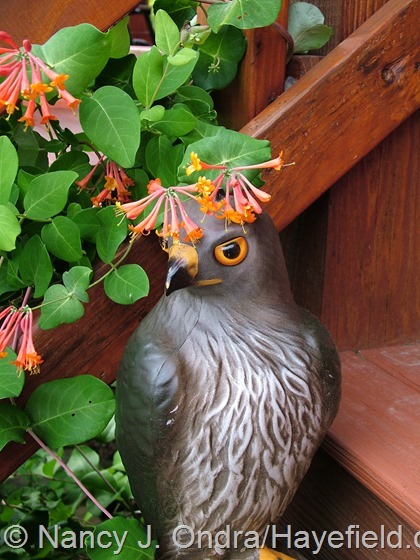 Now that Mr. Hawk has done his job discouraging the robins from nesting on the porch this spring, he’s getting overgrown by the ‘Dropmore Scarlet’ honeysuckle (Lonicera x brownii). 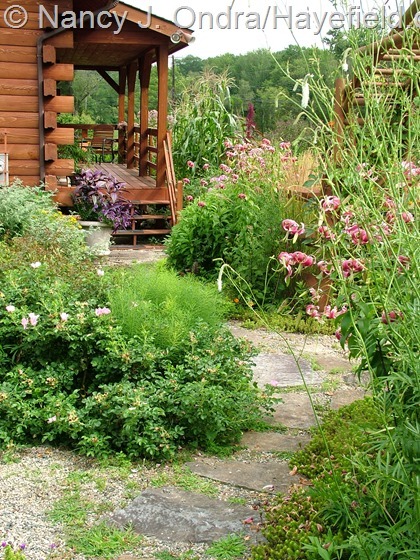 Looking for more late-summer gardens? 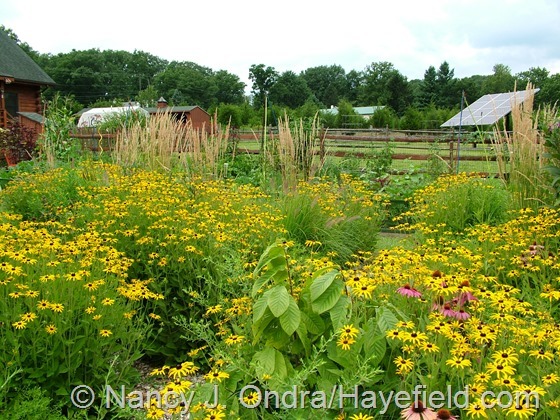 Check out the list of this month’s Bloom Day participants in Carol’s main GBBD post at May Dreams Gardens. Thanks for visiting! stunning – and gorgeous photos too! Have you thought about producing a calendar? or a mouth-watering glossy coffee table book on the garden?! You’re so kind, Rose. 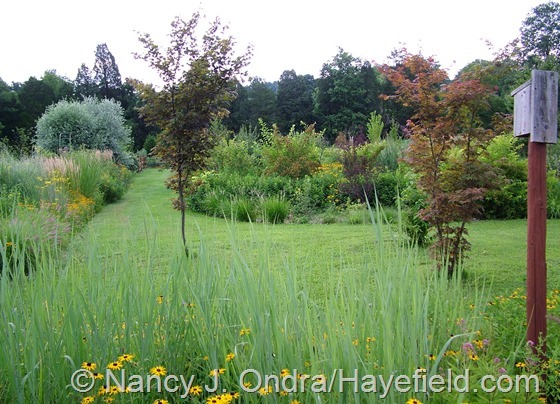 Who knows – maybe someday there will be a proper book about the garden, but for now, I mostly just use the photos here and in my self-published projects. I appreciate your visit today! 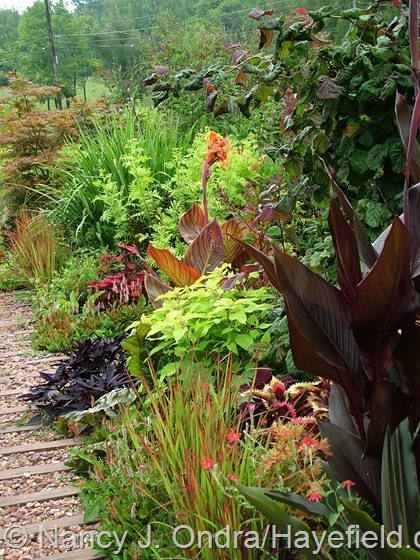 love drooling over your gorgeous photo’s, your garden must give you enormous pleasure! Yes, they do, Becc. The next two months, especially, make all of the work worthwhile. Have a great day! I would be giddy too. Absolutely beautiful. Thank you, Nick. I’m very grateful that cameras are digital now; otherwise, I’d go broke paying for film and developing. Or, maybe I’d just move my office outside so I could thoroughly enjoy the season. Hi there, Allan! I’m always happy to inspire (and to be inspired). 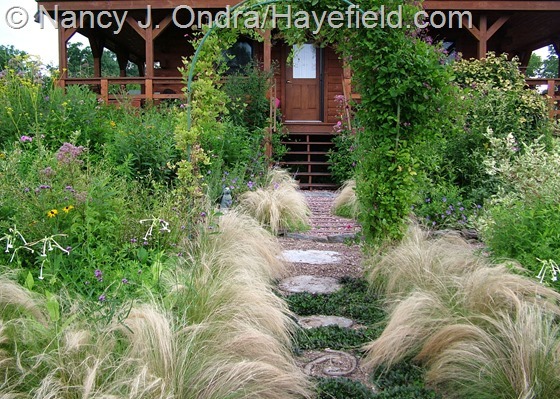 One grass that might satisfy you both is golden Hakone grass (Hakonechloa macra ‘Aureola’), if you can find it. 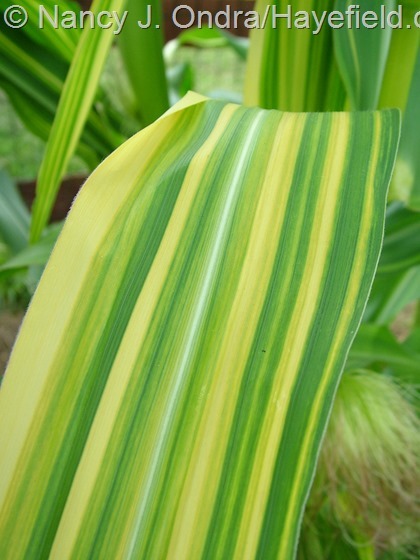 The bright yellow leaves and graceful arching habit make it a beauty for partial shade, and it’s so colorful that even people who normally don’t like grasses can appreciate it. Hmmm…does your soil tend to be on the dry side? That might be a problem. Also, it does seem to take several years to settle in, in my experience, so maybe the one in partial shade just needs some patience? Thanks for the advice Nan, we garden on heavy clay soil so dryness not really a problem. Think you hit the nail on the head when you said patience lol. 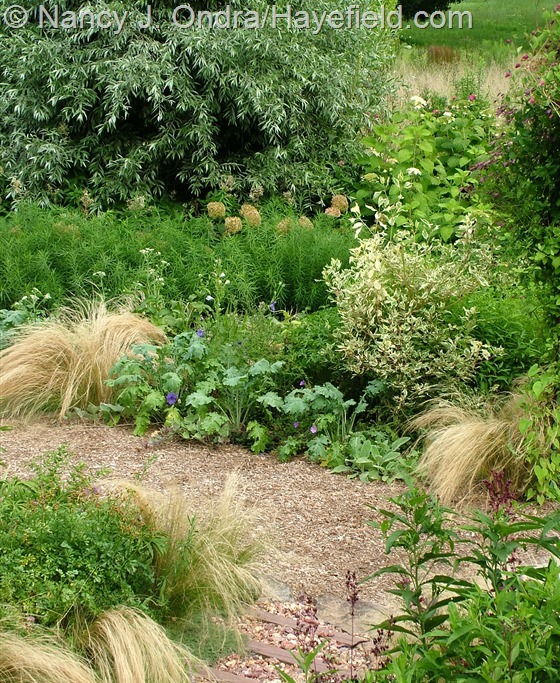 I have just checked on the clump in partial shade and it is coming along nicely. Do you feed yours we haven’t but might do see if it helps. Thanks again. Hi Allan. I don’t fertilize any of my plants, but you could try that. I’d say it took my plants a good five years to really settle in and take off. Just gorgeous. It’s so nice to see all the photos, to just drink in all the variety, all the color combinations, all the beautiful tableaux you’ve created. I hope you know the abundant pleasure you provide us with your pictures (and descriptions)! I’m so glad you enjoyed the tour today, Vicki. I keep thinking that you all must be getting bored with seeing the same parts of the garden month after month, so it’s good to know that you’re still finding it worth a visit. WOW the garden is looking gorgeous! Just to let you know I gave most of my plants from axminister streaked away last year to plant sales but of the three I kept the one is a perfect specimen and the other two are shorter and blue(they only bloomed for the first time this year) but still beautiful! 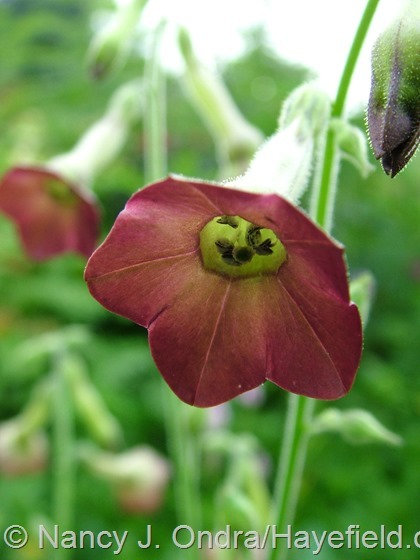 Your green nicotiana has now reseeded in my garden this year and is better than starting it from seed in the house, I gave a few to a friend last year and hers came up with red backs, very strange! My immortality iris doesn’t rebloom for me, it trys but the frost takes it in Oct, oh well its a beauty for me once a year! I really appreciate the seed report, Sue. I’m glad that at least one of the balloon flowers came true for you. And those nicotianas–they seem to have developed a mind of their own! Sorry to hear that your ‘Immortality’ doesn’t get a chance to flower a second time. It’s so nice that it’s worth growing just for the May or June show. Mine doesn’t always rebloom, especially if it’s been really dry, but that’s not been a problem this year. Always beautiful, always inspiring. I really don’t know how you do all this. 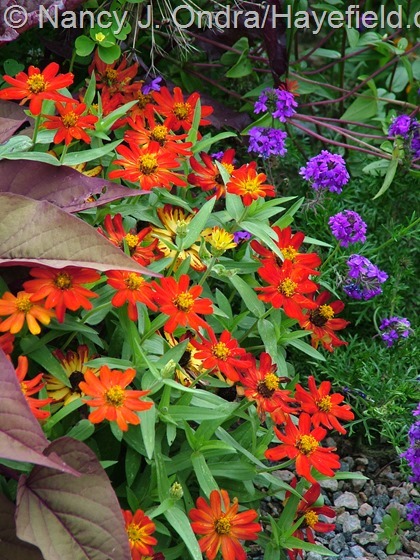 I love the golden lace and orange zinnia combo too. Hi Melanie! 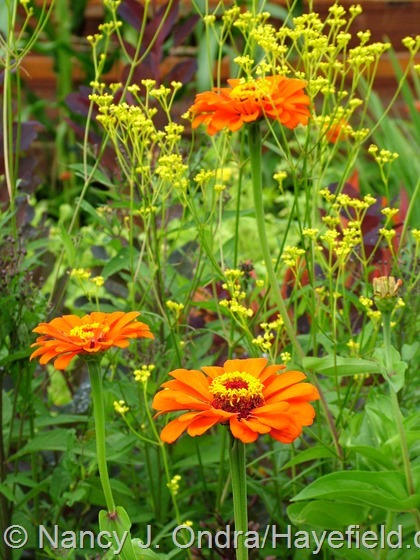 I didn’t expect to see that combo, because most of my zinnias don’t get tall enough to reach the patrinia flowers, but that ‘Orange King’ (new for me this year) is amazingly vigorous. 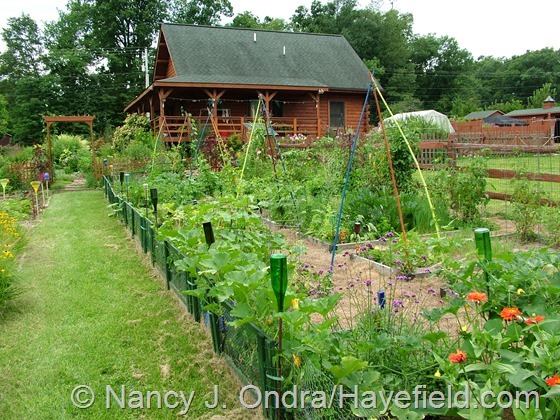 I hope your garden is doing well today too! 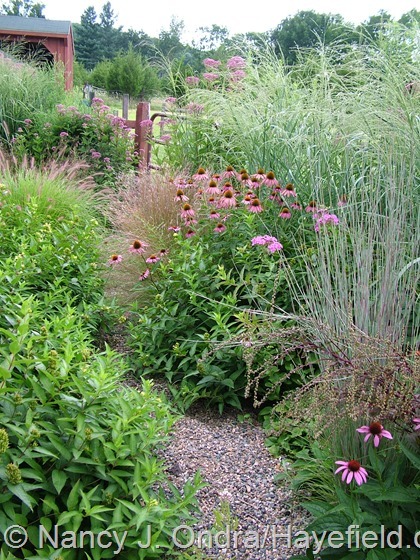 as always your gardens inspire and encourage me! beauty abounds!! thanks for all the time you take to share your work with us! It does take a good bit of time to put these posts together, but it’s a lot of fun too–well, except for having to narrow down the pool of hundreds of images from the last two weeks. (Yes, I know it’s hard to believe that a post this long is actually “narrowed down,” but, well…it’s really hard to stop, you know.) Have a wonderful fall, Julie! Good Morning! I arose knowing it was the 15th of the month but disciplined myself to bake a batch of hot biscuits (out of bread) to top with newly made crabapple jelly for husband and self. Then a cup of coffee and off to Hayefield! What a glorious trip! I enjoyed things very much. I’ve lost my patrinia, must get a replacement start from my sister. I enjoyed looking at all the various grasses. 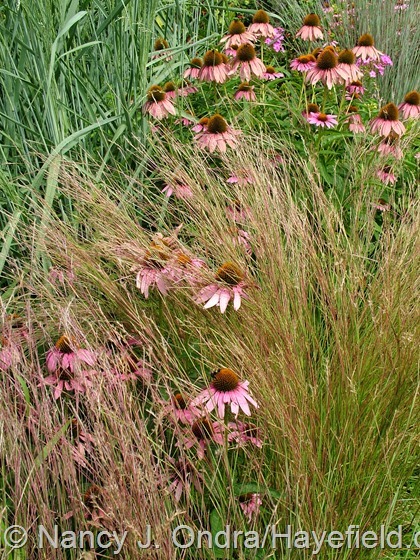 Is the Mexican feather grass hardy for you? I was interested in the close-ups of the different nicotanias. I’d written before about your green mix but the others look very interesting also. Your photos of cannas intrigue me. I thought I didn’t like them, then became interested in the darker foliaged ones. A Tropicana with a damaged main flowering stem was 1.99 at Lowe’s so I’ve ventured. Next, smoke bushes. Thanks so much for your communications with us all. Chris N.
Oh, now you’ve made me hungry, Chris! Oh yes, the feather grass is now hardy here, for about the last 5 years. And now it is starting to pop up on its own, which is making me a little worried about it. Congratulations on taking the plunge on a canna. Tropicanna is one of my favorites! Hi Chris, I didn’t like cannas for years until the darker ones became more readily available. I now love them for their dark beauty. I also love striped ‘Bengal Tiger.’ Sorry to jump in Nan. Chris just made me think about how much I once disliked cannas, and Oklahoma is a huge canna state. Just luscious, Nan! 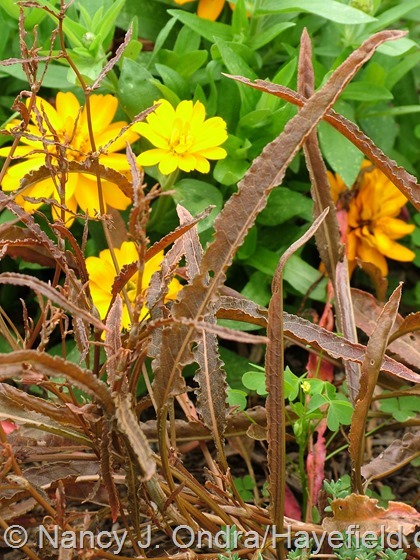 Do you cut back your cotinus? Hi Lorraine! Yes, I do cut back those in the front garden. It’s a little different each year, depending on the weather and the vigor of the plants, but I mostly take them back to 12 to 18 inches in spring and cut back again by half in early summer. ‘Grace’ is a lot more vigorous than ‘Velvet Cloak’, so I often thin out her new growth after the first flush as well. Hah – I guess I should have explained that one too. Well, I dug that whole area during a brutally hot spell one year, and the only thing I could think of the whole time is “I’m going to die.” So for a while, it became the I’m Going to Die Border. But then Mom misunderstood when I mentioned the name, and she started calling it the To-Die-For Border. That seemed like a much nicer name, but a rather vain thing to call one’s own creation, so now I use TDF Border for photo tagging. Your gardens look phenomenal. I tend to associate end-of-summer with things not looking so great, but you clearly have a gift. It’s a trade-off, Kathryn, since the place isn’t all that spectacular in spring to early summer, when many gardens are at their peak. But it’s fun having an extra-long period of anticipation! Your garden is so beautiful. I very much enjoyed the tour and seeing all your wonderful combinations. Many of those I can achieve in my hotter, dryer climate at a cooler time of year. 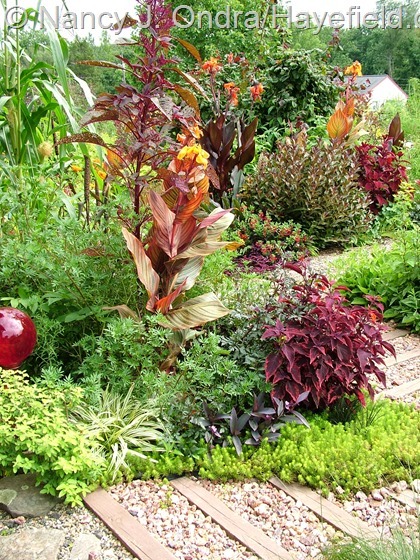 Using so many different plants and blending them into a whole while letting the form and color of each stand out makes your garden special. I love how you achieve that look and will study your photos again and again. Welcome, Shirley! I’m so pleased to hear that you enjoyed the combinations. I have to admit that things don’t normally look so lush here at this time of year, because we’ve had loads of rain and, except for a few weeks in July, relatively cool temperatures. 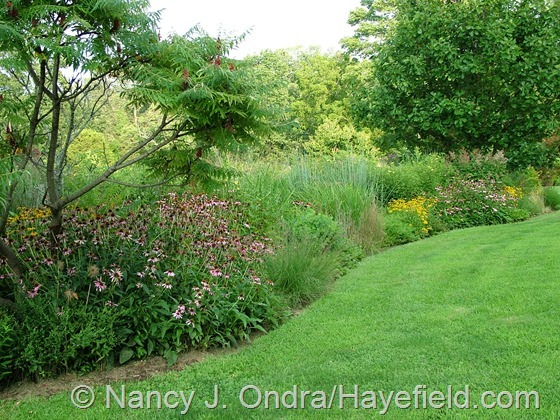 My husband and I are in the process of tearing out another section of worn-out lawn and I’ve been thinking of filling much of the area with ornamental grass – viewing your August garden has reinforced the value of that plan. Your plant combinations, as usual, are wonderful. I tried the ‘Fishnet Stockings’ coleus myself this year, only to have it turn completely purple. Any ideas as to why that happened? Too little sun – or too much? Don’t give up on your ‘Fishnet Stockings’ yet. I have seen it look very different over the course of one season. The amount of light does seem to have an effect, and perhaps the temperature and the age of the plant as well? It’s just been in the last two weeks that mine has been looking really good. Earlier, it was a muddle of purple with yellowish green. Good luck with your new garden! 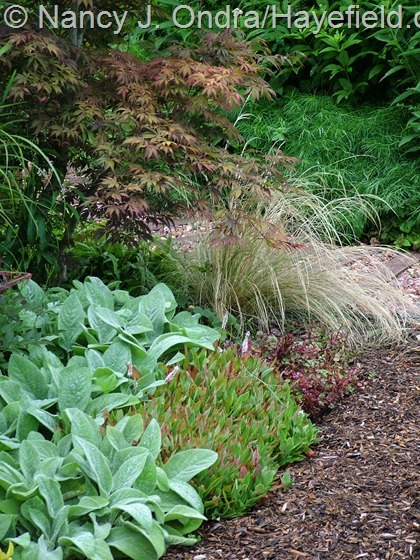 This is a great time of year to pick up overgrown pots of ornamental grasses on sale. Wow. Absolutely incredibly gorgeous, Nan. I hope one day I might get to see your gardens in person. You have an amazing skill! Thanks so much for taking the time to visit, Kathy. See, it really *is* a late-season garden! I love all the grasses in this post. I’ve always been a bit scared of trying Panicum because I’ve heard rumours that it can get out of hand. I think i’m going to give it and Schizachyrium a try. 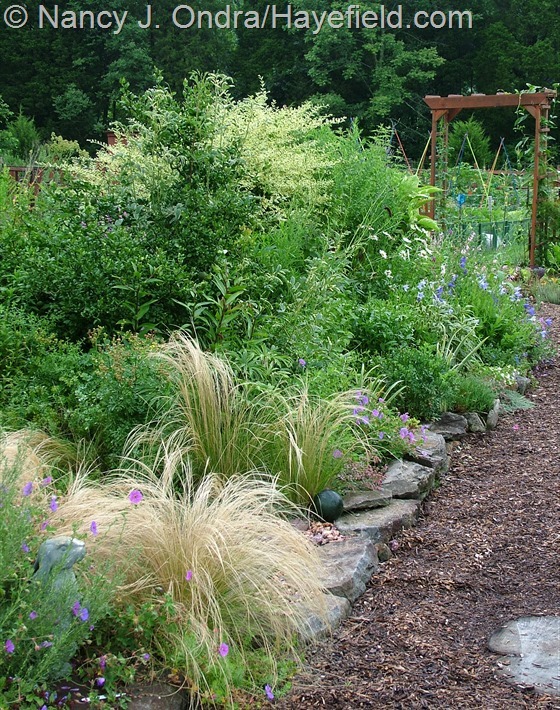 There’s a great little online grass source, Bluestem Nursery, that I’ve always been tempted by. 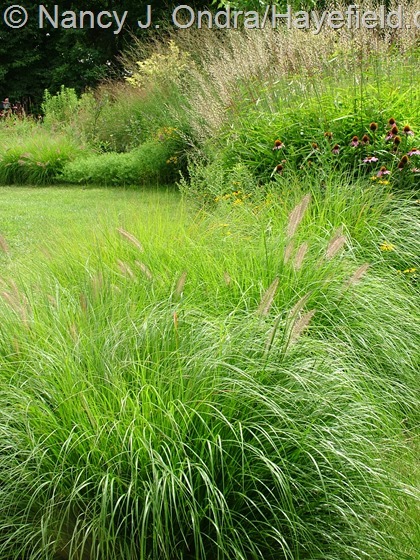 What’s been your experience with keeping grasses under control ? Hi Jesse! Sure, I’ll save some of the ‘Erica’ seed for you to experiment with. Mine is more pink than usual right now, due to our cooler-than-normal weather. And definitely, let’s try again with the Vernonia lettermannii. I can’t say that I’ve ever had any worries about the panicums getting out of hand. 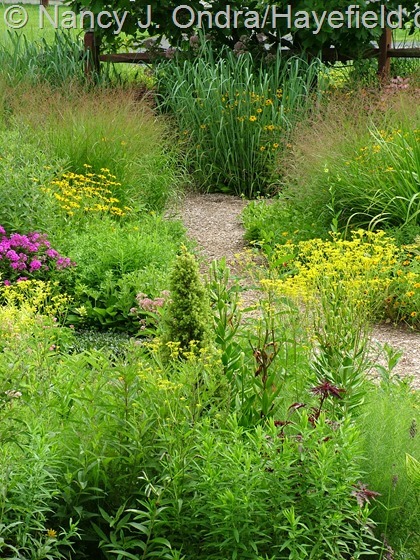 Granted, some can get very tall and flop if they are in rich soil or too much shade, or if the clumps need to be divided. I’m not so good about keeping up with division, so if I remember that a clump got rather large the previous year, I let it sprout up to a foot or so tall and then cut it to the ground to reduce the vigor a bit. I do now find some seedlings, but I don’t consider them to be troublesome self-sowers, either. 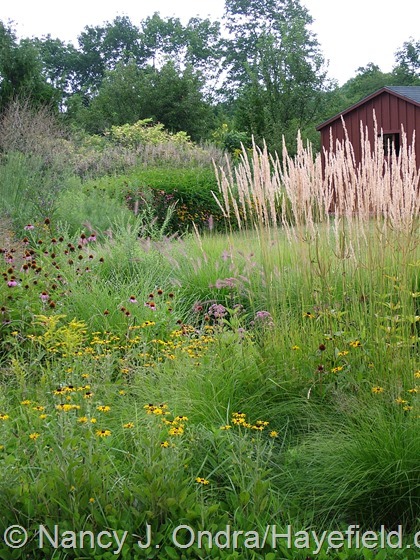 The same goes for little bluestem, prairie dropseed (Sporobolus), and frost grass (Spodiopogon), and the ‘Karl Foerster’ calamagrostis is sterile, so seeding isn’t an issue at all for that one. The fountain grass isn’t much of a problem self-sower in the garden, but it does pop up a fair bit in the meadow downwind of the garden, which makes me a little nervous. 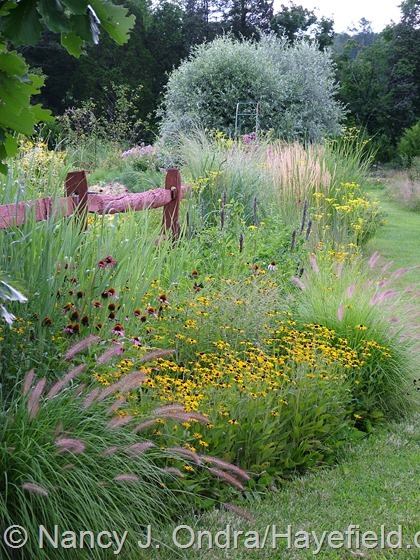 None of the grasses I grow are runners, so I actually never think much about “controlling” them; I mostly just leave them alone after their yearly cut-back, except for dividing them if I need starts for a new border. As always, Nan, your posts are the high-water mark by which all Bloom Day posts must be judged! 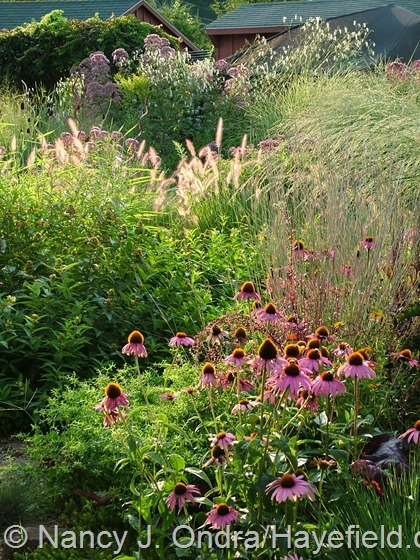 Love that shot toward the beginning of the Echinacea and all the backlit grasses…just magical! Seriously…all the photos of the grassy areas are amazing…and the Patrinia is such a great contrast throughout there. So glad you ID’d the Thermopsis villas for us…love those dark seed heads! Good to hear from you, Scott! The thermopsis is pretty during its short flowering period, but those seedheads are really nice for the rest of the season, and into winter too. Happy Bloom Day to you! I’m surprised nobody has commented yet on that amazing Rumex flexuosus! I have never seen it. Maybe you can save some seed from it. 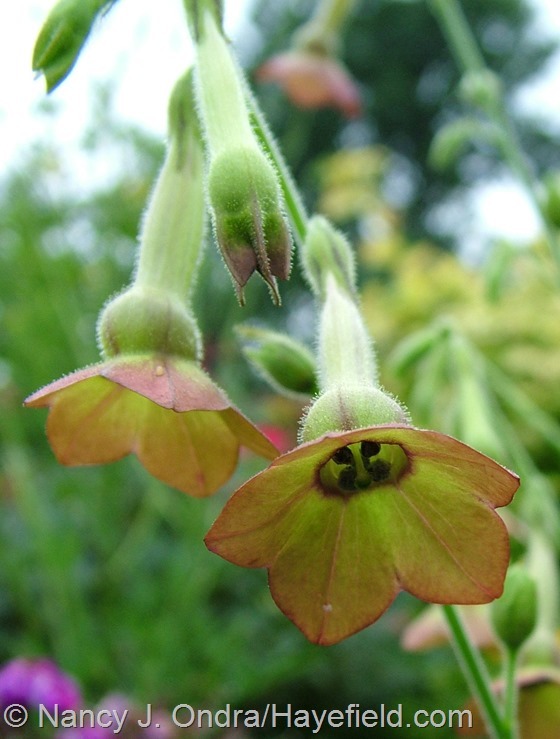 I grew Nicotiana sylvestris seven or eight years ago hoping it would reseed. It never did… until this year! Do you ever have things disappear for awhile and then come back? Yay – you like it too! It’s not exactly a pretty plant, but I think it’s neat. I definitely plan to collect seed if I can and will make a note to keep some aside for you. How fun to hear about the amazing return of your nicotiana! I do have that happen sometimes, but I don’t think it’s even been *that* long between the disappearance and return. Gorgeous as ever Nan. Trawling through your lovely photos is a treat I really look forward to. A most enjoyable way to have a cuppa and 10 minutes to myself. My Ondra Nicotianas were mostly the smaller green Langsdorfii type, but they self seeded and I look forward to another summer of them. Some are even flowering now (mid winter). I haven’t had any browny ones yet, but they’d be welcome too! Let me make it very clear Nan that there is no such thing as too many photos in a post! I savour every one as there’s always something to be learnt in each of them. Thanks, Kerry! I’ll be really interested to hear how the next generation of the nicotiana turns out for you. By the way, I’ve been enjoying your Hibiscus trionum for months now. I’ll have to get a picture for the next Bloom Day post, if I can. Enjoy your winter “rest”! Oh yay! I’m so glad the little hibiscus is doing well for you! I’d love to see photos of it in your garden so far from here. It’s an unusual little native (our flora is not known for it’s flowers!) 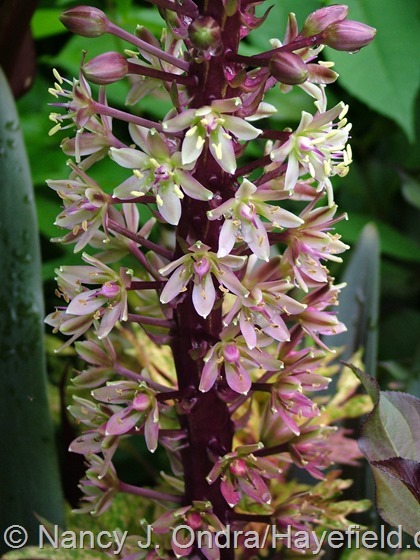 but I know that H. trionum is a weed in some parts of the States – is it the same plant? 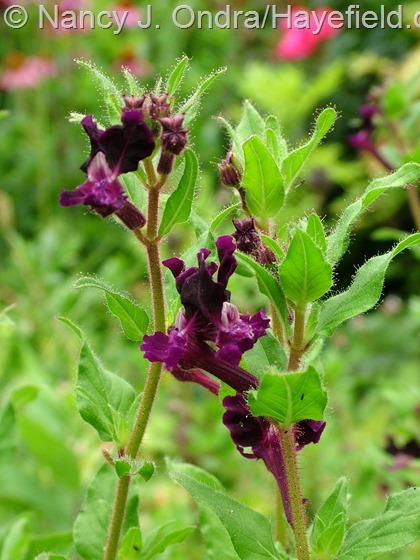 Honestly, yes, I’ve had it come up on its own before, but yours is so much more bushy and flower-filled that no one would mistake it for a weed! Aha! Now I know what to do to keep ‘Grace’ in check! I love her color, but she sure shoots up, so thanks for the info on trimming her back, will do next spring. 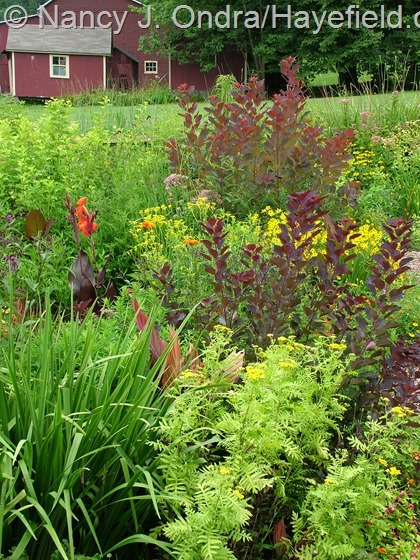 Your late summer garden is a beaut, thanks for sharing it all. That little unknown marigold is sweet! Hey, Donna. The second cutting-back combined with the thinning (I leave just about a third of the new shoots that emerged from the spring cut) has produced really good results with the ‘Grace’ I have out front. But then I have another out in the shrubbery which has hardly grown at all in the last few years, so I don’t dare give that one the same sort of treatment. Your garden is lovely, thanks for all the ideas for combinations. 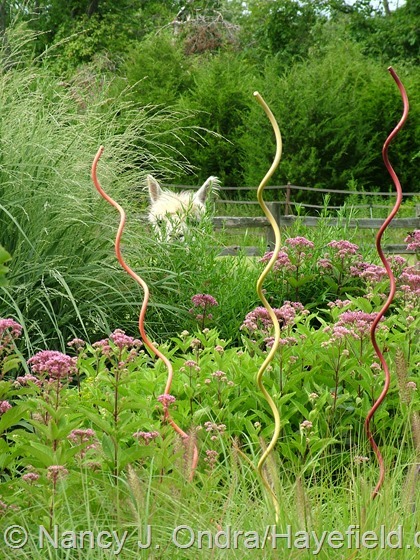 I like the Mexican feather grass, it looks like a long-haired guinea pig. 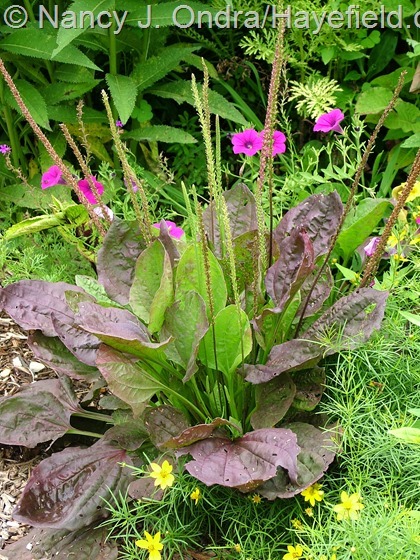 I had to smile at the purple-leaved plantain since plantain is a persistent weed in my yard. Last year I had one with variegated leaves pop up in my gravel driveway. I thought maybe I could make money selling it but didn’t take care of it and save seeds. “a long-haired guinea pig” – I love that, Hannah! The purple plantain falls in the “if you can’t beat them” category, because I too am endlessly pulling out the green ones. Absolutely stunning, peaceful, restful and ALIVE! Simply wonderful. All of that, for sure. Thanks so much for reading and commenting. Happy Bloom Day! Your garden is always amazing to me. 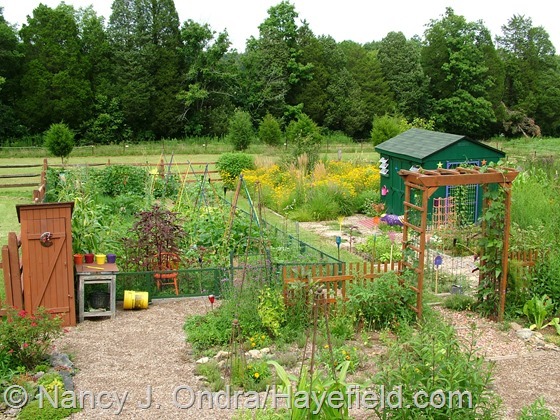 I like the overhead shot, and the last one with one of your garden fertilizers in the back peeking at us. Happy GBBD. I’m thinking of adding a “Spot the Alpaca” contest feature, with one or the other of the boys (or both of them) hiding in one picture in every post. But Daniel, at least, is pretty easy to spot, so no…maybe that won’t work. Thanks for checking in, Lisa, and Happy Bloom Day to you too! OH Nan! I am so thankful you indulged your need to get out in the garden! 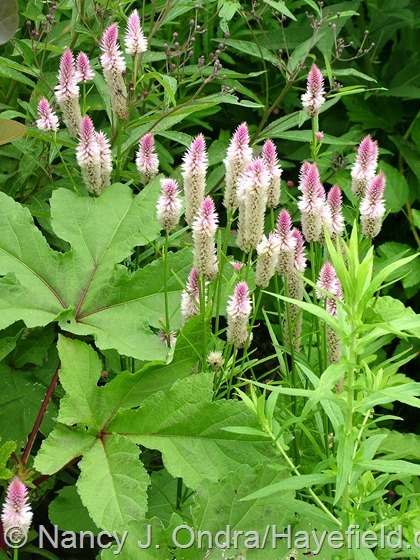 I have a number of plants from your seeds-Japanese Burnet, Giant echinacea, South American foxglove- such joy! I need to move out of the city for alpaca, and more rainfall! Good to hear from you, Kay. 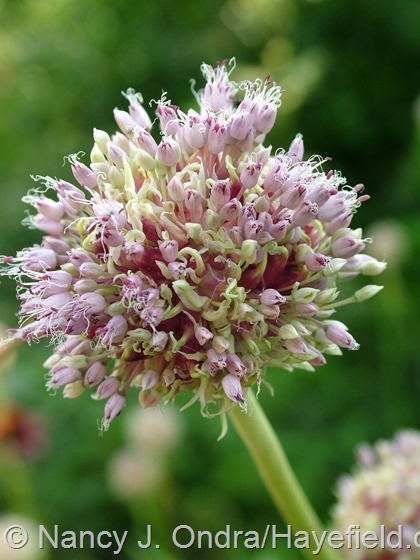 I particularly appreciate you mentioning the sanguisorba (burnet), because no one else has said whether or not they had luck with the seeds. 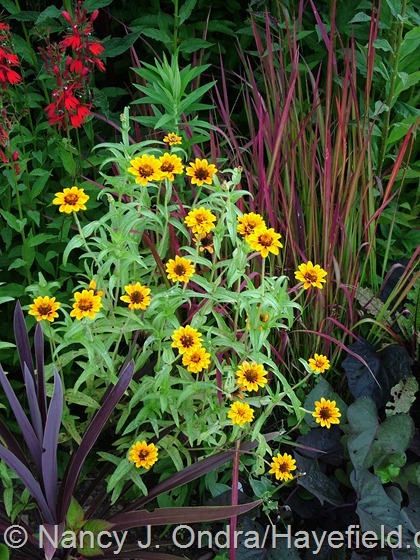 And I’m wondering about the “giant echinacea”–if you meant the giant coneflower (Rudbeckia maxima)? 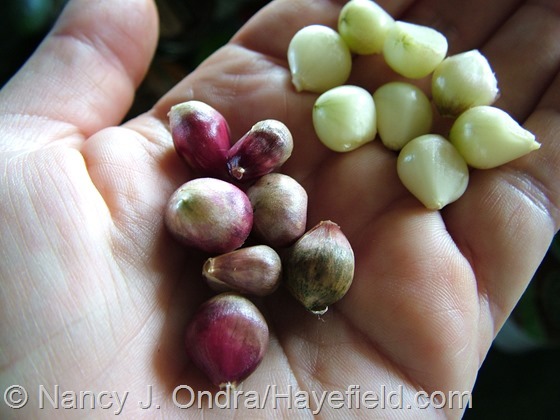 If those too germinated well for you, that’s great news! Hey Nan I also got a handful of great looking burnet from the seeds you sent out last fall so they were definitely a success. Great – thanks for that news, Jesse. I often find that the burnet seed I get from other sources is only chaff. I was pretty sure that I managed to end up with pure seed after the cleaning process, but it’s kind of hard to tell without really good near vision. I have a garden just like yours! It is in my dreams. In reality I garden in a colder place with much less space than you have… a city lot… I too wait to even open your posts until I have time to spend reading details you include to describe each picture. Don’t you just love the playful name given to Religious Radish? I have that coleus too, it’s one I’ve carried over about 3 winters now. I haven’t tried it in much sun though…. Now that I see your pairing with BoL I think I need to try it in more next yr with one of my Bishop’s Children. If it works w/the Bishop, surely it will with the Bishop’s Children! The rumex flexuosus caught my eye right away too, very intriguing… if you do get some seed… I’d like some. 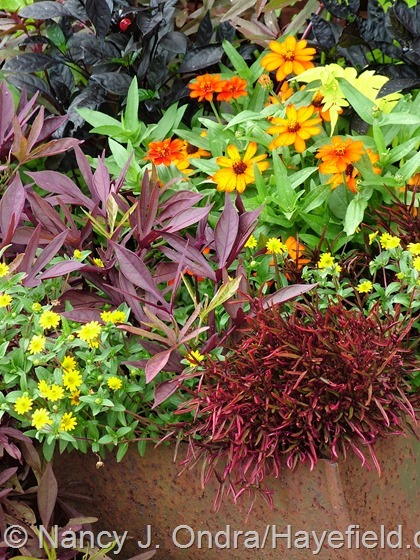 I do lots of containers and am always rearranging groups according to who’s blooming or at their best. This would be interesting to add to the mix. Last season I was lucky enough to get some seed for your pink species clematis, not sure w/o checking, but I think it was viorna… out of 3 seeds, I did get one to germinate and it is growing, slowly at this point, in a pot. All but the 3 were cracked apart in the mail. Now I fear that it may not be hardy here in z 4. When I requested it I thought it would. I plan to keep it growing in a pot, frost free. I set up lights in the basement to help things along over the winter. Any tips? Hi Jeanne! Yep, my ‘Religious Radish’ coleus is in pretty much full sun. I bet it would pair well with any of the ‘Bishop’s Children’. The rumex does look great in a container: the leaves are kind of arching, and the plant has a rather loose, sprawling habit. 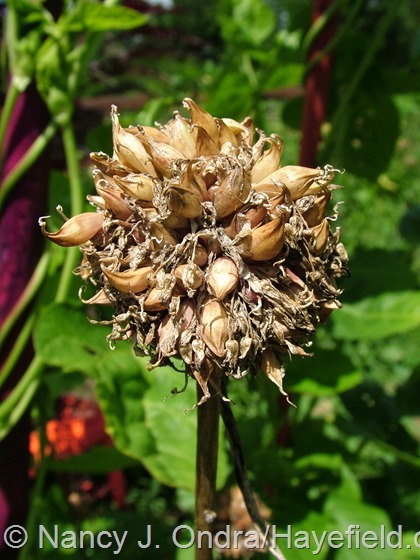 So sorry to hear that some of the seeds were damaged. I think I’m going to go back to requesting SASEs this year; then people can decide if they want to put on additional postage or send a padded envelope for extra protection. I’m pleased to hear that you got one to germinate, though. 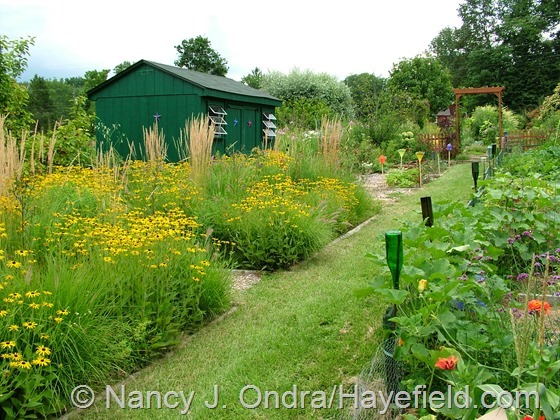 I think it might be hardy in your area, but it’s probably a smart idea to wait until next spring to plant it out. Some plants need a winter rest period to grow properly, but I’m not sure about clematis. Maybe you could leave it outside until some time in December so it can have a few months of chilling before bringing it back in? 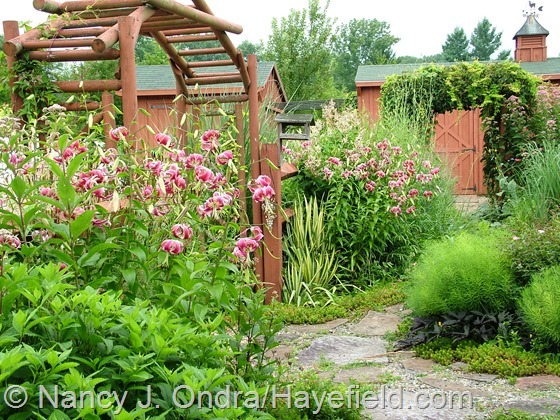 Or, you might want to ask about indoor overwintering on a clematis forum. Happy GBBD! I’m a bit delayed but we have two boys off to college this week. 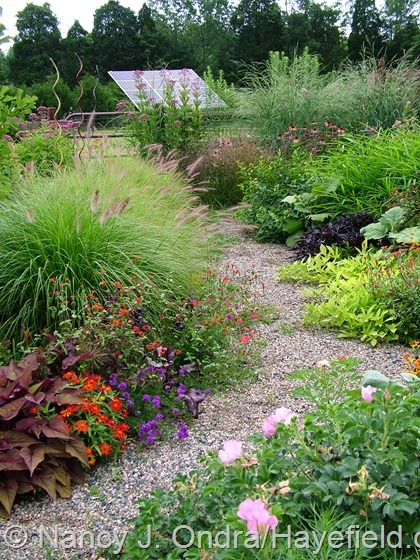 Your gardens seem massive and I can tell that you selected easier cultivars. 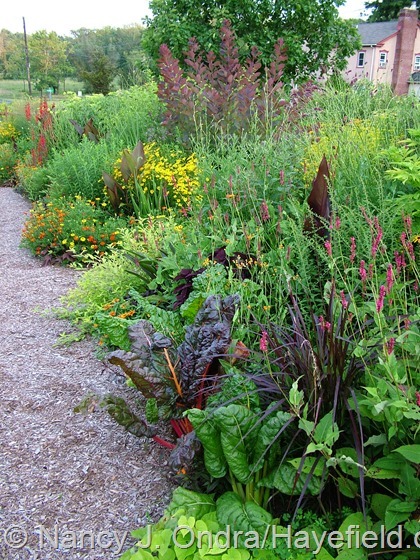 I know the “guilt” of a garden but it’s the joy of the presence that we do it, right? Oh my, Janie – it must be very quiet at your house right now. I hope your garden helps to fill the void a bit. Thanks for stopping by, and Happy Bloom Day back to you! My garden wants to be your garden when it grows up. Spectacular!! Thanks, Casa! 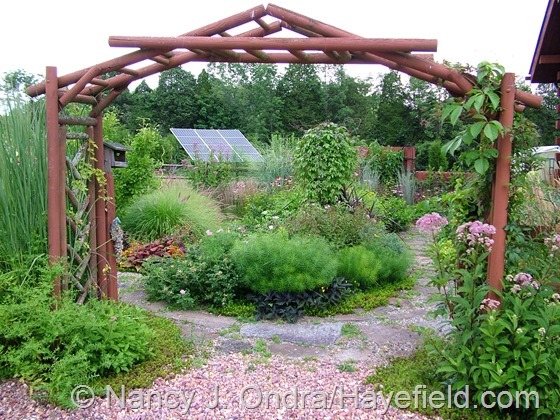 Let’s see…it’s been in the works for 12 years now, so what would that be in garden years? Certainly middle-aged, at least! I’m glad I stopped by a few days late, The comments and responses add so much to the original post! Things look great, I appreciated all the wider views this time, it really gives a sense of place. Love the last picture, I can’t help but feel he’s making bunny ears back there behind one of your grasses. He’s up to mischief for sure! I again have a few goodies from you that I’m really pleased with! This year I used some leftovers from the previous year and have a nice bunch of ‘old gold’, another vicious looking purple malevolence, and bunches of the green nicotina. The first year I had nothing but green, this year (using the same seed packet) I have a range from browns to pale green to solid green. Go figure! I did have a nice aurea wafertree coming along but it died due to drought (stop hogging all the rain!) and my bestest plant was the ray’s golden campion which seemed to bloom endlessly, and I’m starting a few new ones this year in case it bloomed itself to death… oh and one Oakhurst seedling is coming along nicely despite my neglect. Thanks again for all of them, I wish I had something with which to return the favor. Just knowing that the seeds are thriving in new homes is all the return I need, Frank. How interesting about the same packet of nicotiana producing different results! That’s just bizarre. I need to check the wafertree to see if it set any seed this year. If it did, I’ll save some for you. Sorry about us hogging the rain. I can’t say I’ve been sorry to have it, but I’ll wish some for you too. Hello Nan, your garden takes my breath away every time I see it. Oh to stroll those paths and see the everyday changes. Or, are you like me? I try to stroll and then I see some blasted weedy bit in the camera lens. Before long, I’m on hands and knees working again. However, any time in the garden is good. One question, your garden seems to be very large. Do you do all the work yourself? I am finding I’m not as quick as I once was, and I’m thinking of hiring a bit of help. Hi there, Dee. Mom does the mowing for me in the shrubbery, and she processes the veggies I grow, but otherwise, yep, it’s all mine to deal with. I usually have the opposite problem that you do: I set out to weed and then end up grabbing my camera. I sometimes do a bit of quick grooming if I’m out trying to take pictures, but I’m worried about anything happening to my camera (it’s almost 10 years old now, and I’m dreading having to try to replace it), so I make sure it’s carefully put away before attempting serious garden maintenance. I wonder why your sky is always grey? It’s not really always like that, fortunately; it’s just that the plants photograph best when they’re not in strong sunlight, so I usually only shoot when the sky is overcast, or else at sunrise or sunset. I tried to speed read the pictures and got dizzy! Wow. Best enjoyed at a slower pace. It’s a lot to take in, isn’t it? I hope you find some time to peruse it at your leisure, Carmelita. Have a great week! This is my first year enjoying your work ( first year on the internet, actually) & I am so impressed with your ideas & accomplishments! My head is spinning at all this late season beauty. 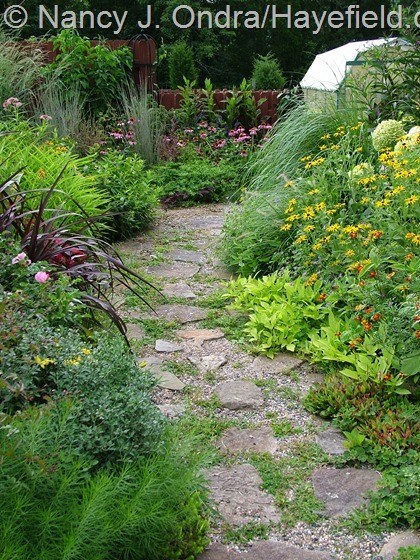 I am now firmly resolved to take my own limp late garden in hand, using many of the inspirations I’ve found here. Thanks for all that you do to share this abundance with us! Welcome, Michele, and thanks for reading. I wish you loads of luck as you and your garden grow. I hope you’ll come back soon; it’s almost time for the next Bloom Day!